Sun Moon Flows explores the duality of the sun and moon energies. We all possess feminine and masculine energy. The sun represents the divine masculine: action, power and strength. The moon represents the divine feminine: intuition, compassion, and creativity. This program offers two Sun and two Moon classes to balance these energies within you, create a sense of mind/body equilibrium, and tap into your peace and power. Kate Van Horn is a yoga instructor, wellness influencer, blogger and co-founder of The Good Fest. She is passionate about teaching individuals how to find and celebrate their power. 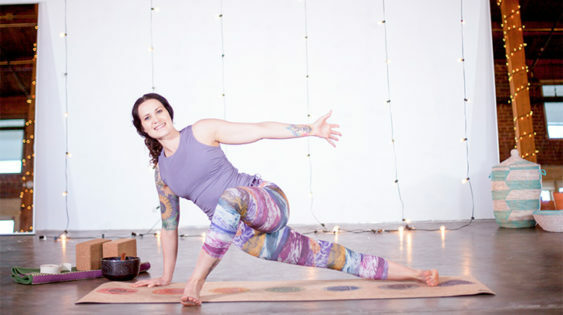 Kate's warm, welcoming teaching style will draw you in, put you at ease, and help you find your peace and your power. Start here! Learn all about this program, how to approach it, and how to get the most out of it. Get ready for a full-body flow to open up your hips, hamstrings and shoulders with long, strong holds and juicy twists. Build heat with a focus on core work to tap into your power and stability, along with power movements and flows to build serious strength. The New Moon is the start of a fresh moon cycle, so this class represents a chance for you to let go and reset with fluid, dynamic movement to reconnect to your creativity and spark new ideas. The Full Moon represents a time for reflection. Enjoy this mindful flow with fluid, expansive movements to help you reflect, take up space, and dive within.